MIDDLETOWN—Danny Fine tells how George Clooney played with a quarter-sized batmobile during a break in filming a Batman movie and had so much fun that he broke a $30,000 movie camera that had just filmed a scene. “They laughed it off and shot the whole thing all over again,” he said. Danny has this and other stories of the days he and his brother Chris Fine made cars for the Batman franchise and other films for Warner Bros. Entertainment, Inc. Walk into Mid-Hudson Hobbies and proprietor Danny Fine says you will never grow up. They made the electric bases for the quarter-size versions of the real vehicle used in the movies. Warner Bros. bought about 65 of their cars in the 1980’s, which have been used in all the sequels. “When they wanted to crash them, it was too expensive to crash the full-size vehicle,” Danny explained. Their work for Warner Bros. provided seed money for their toy car business. 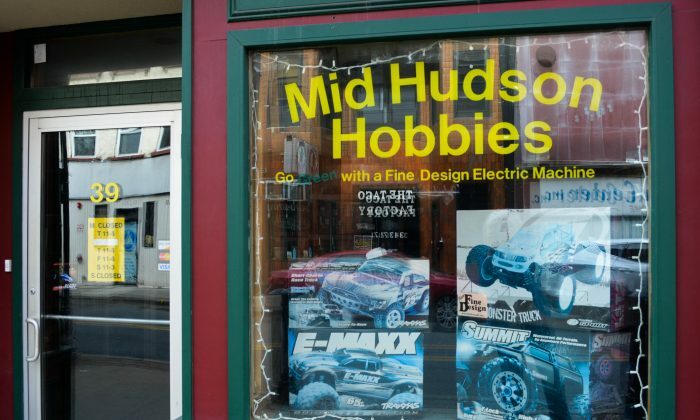 Today the brothers exercise their love for toys at Mid-Hudson Hobbies on Middletown’s North Street. Danny and his brother share the responsibilities of running the store. Danny builds the models and works with customers. Chris handles the online selling and business paperwork. The brothers have a website, Fine Design, where people can order toys. Walk into Mid-Hudson Hobbies and Danny says you will never grow up. Proof of that is a group of men who race their own custom slot cars, electrically-powered miniature race cars that travel in a slot in the track, every Thursday night at the store’s in-house speedway. The track, which takes up most of the store space, has hand-held gear sticks that control how fast a slot car will go. “When you let up, you break, when you squeeze, you get voltage to the cars,” Chris said. Chris said the racers use standard slot cars at 1/24 scale. The die-cast models can weigh over a pound, and the weight holds the toy car on the track. Everybody wants to be deep down in their heart a race car driver. On April 28, Bill Terbusch, Mark Connoly, Ken Costsa, Zack Kohler and his dad, Ed Kohler were racing their custom cars.”Everybody wants to be deep down in their heart a race car driver. Here is a way to have fun, relaxation, and be able to shut off the regular things in life and have fun no matter what your age,” Chris said. He added some of the guys who race slot cars on Thursday nights actually race at the track in life-sized cars, or have raced and are now retired. Danny said they have turned collectible versions of “legend cars” into slot car racers. “This opened up a whole new market for these cars that most people just kept on the shelf. It’s never been done before,” he said. Shawn and Melissa Deloatch came in to check on a repair for a Stampede VXL truck Shawn recently bought. Danny agreed to fix it, no questions asked. Shawn played with cars as a youngster but stopped as he grew up. Recently he said he and his wife were walking around the neighborhood and saw the store. They were intrigued. “We walked in and started looking.” After a few more window shopping visits, he bought the truck. “I fell in love with it once again. I’ve got six or seven more trucks to buy. This is just the beginning,” he said. Shawn and Melissa both like to race. “I don’t have to worry about hurting no one, no tickets, nothing,” Shawn said. “I could go at any speed I want, hit anything, and not have to worry about hurting someone or myself.” His truck can go 35 miles per hour. Melissa says it gives her personal time to “zone out and actually be yourself.” It’s also quality time with her loved one, she said. Collecting cars is a sort of fantasy activity. Some customers buy monster trucks, some sleek racers, others prefer wreckers, police cars, or commemorative replicas. Chris said most of the guys have 25 to 30 cars, “minimum.” He compares it to women’s love of shoes. “You get to race all those cars that you couldn’t afford. You wanted the Ferrari, you can get a Ferrari. You wanted a Lamborghini when you were growing up, but you know you couldn’t afford one, you can go out and get a Lamborghini and race it around the track here,” he said. Racing the toy cars develops hand and eye coordination skills. There is another benefit to playing with toy cars. Danny said racing the toys develops hand and eye coordination skills. When learning to drive, if someone has raced slot cars, they know to slow down at a turn, he said. “This is hand and eye coordination that’s drilled into your depth perception, into your mind. By the time these kids get out there and it’s time to drive, they realize, no matter what, you can’t be speeding down a straightaway, you have to watch out for the next guy,” Danny said. Both worked as mechanics. They operated an appliance business as well, but soon realized it was not much fun. “Your youth goes away,” Danny said. They started the hobby store in 1985.